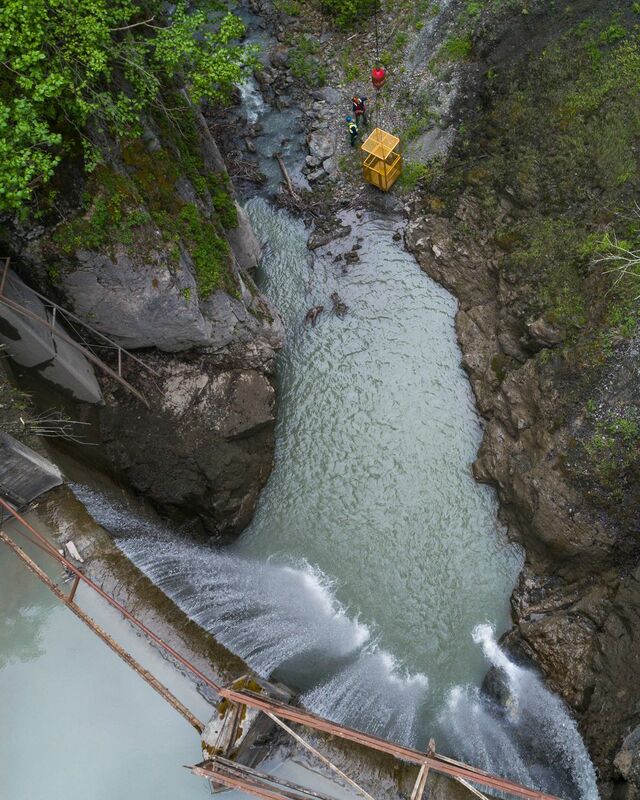 A long-orphaned dam on the Eklutna River is getting demolished after sitting unused for over 60 years. But there will be no explosives bringing the dam down, nor will there be any wrecking ball smashing the 70-foot-tall concrete structure apart, despite the on-site presence of the state's largest crane. Instead, construction workers will dig out the 300,000 cubic yards of sandy sediment that has filled in behind the basin that was designed to hold water, not rock. They'll then slowly chip the dam into pieces no larger than a basketball using jackhammers attached to backhoes. Those pieces of dam will remain in the canyon, spread out along the banks of the river it's currently clogging. 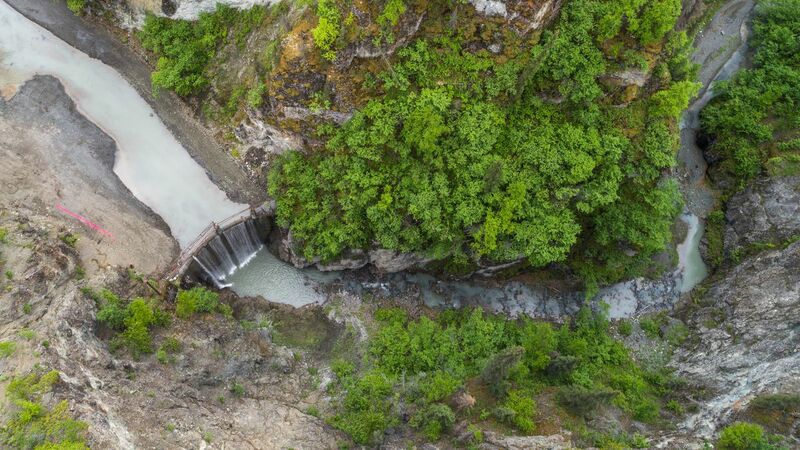 Brad Meiklejohn, Alaska state director for The Conservation Fund, an environmental nonprofit coordinating and funding the dam's removal, said the "slow, meticulous process" will take about three months to complete and cost the nonprofit $7.5 million. "It would be handy to be able to blow it up, but it was not an option," he said. Meiklejohn said the idea of removing the dam, located about a mile and a half east of the Glenn Highway, has been in the works for years. It was built on the Eklutna River in 1929 as a hydroelectric diversion dam. Water from the river pooled into the dam before being funneled to an electric generation plant. But construction of a new power plant diverted the river away from the dam in 1955. Still, the dam remained, essentially orphaned, Meiklejohn said. A 1997 agreement with local electric and water utilities, federal agencies and the state of Alaska required the dam to be removed by 2027. But little movement occurred until The Conservation Fund got involved. The process has moved quickly since The Conservation Fund decided to make removing the dam a priority in 2015, Meiklejohn said. When he started working with Eklutna Inc., the Native corporation that owns the land the dam is located on, he expected the removal process to take at least a decade. But permitting and other planning and fundraising efforts came together quickly. "There is a lot of popular support," Meiklejohn said. "A lot of people see it as the right thing to do to fix the river." Today, only a small trickle of water leads up to the dam, far from the steady river that carved out the 400-foot-deep canyon over a millennium. Meiklejohn said none of the water today comes from the lake and is instead a series of small creeks that deposit in the canyon basin. Access to the dam is difficult. A 400-foot-tall set of aluminum stairs was built last year and placed along the walls to allow construction access to the top of the dam. The crane will slowly lower bulldozers and backhoes down to the dam, since the narrow canyon makes it impossible to drive equipment up to the face of the abandoned structure. The cliff face has been a popular dumping spot for junk cars and broken appliances, and Meiklejohn said that before they could begin demolition, they removed 30 tons of garbage and debris. Still, some of it remained on a tour he led for reporters earlier this week, including an abandoned human-sized stuffed duck, an engine block and a bowling ball. He said when demolition is complete, the area will eventually return to its natural state, with high canyon walls visible once again. Rick Sinnott, a retired Alaska Department of Fish and Game wildlife biologist, first learned of the dam in the late 1980s. 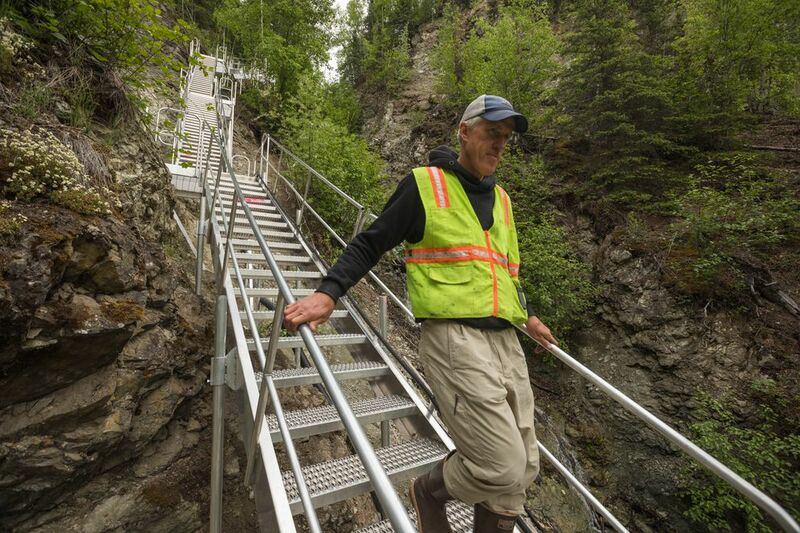 Since retiring, he's written several articles for Alaska Dispatch News detailing the dam and its impacts on salmon and wildlife. Sinnott said getting the dam removed is the first major hurdle in returning the river to its natural state. While more remains to be done — including figuring how to get more water from Eklutna Lake diverted back to the river — Sinnott said it wouldn't be surprising if fish came back quickly, and even more animals after that. He said people can expect to see a more natural ecosystem of birds, bears and other animals return to the area in greater numbers. "It's just kind of this cascading effect," Sinnott said. "It's a small valley, it's not the biggest valley in town, but it's been sort of orphaned by the fact that the fish are missing, so you add the fish back in and that will change things."